GitHub - n0shake/dash: 🍲 DoorDash from your command line. 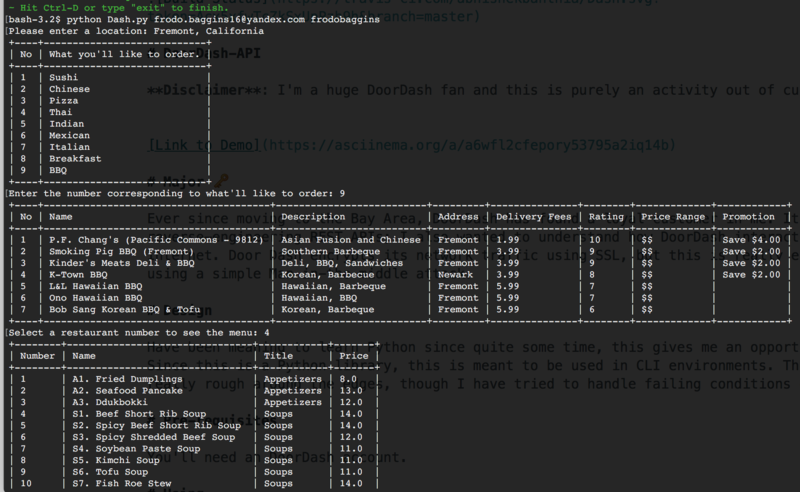 🍲 DoorDash from your command line. Want to be notified of new releases in n0shake/dash? Disclaimer: I'm a huge DoorDash fan and this is purely an activity out of curiosity. This is a work in progress and I half-expect it to fail for certain input. Build the Dash.py using your credentials and follow steps to add items to your cart. Ever since moving to the Bay Area, DoorDash has found a loyal customer in me. It's always fun reverse-engineering REST APIs; I also wanted to understand how DoorDash interacts with the Internet. Door Dash encrypts its network traffic using SSL, but this is really easy to get around using a simple Man-in-the-middle attack. Have been meaning to learn Python since quite some time, this gives me an opportunity to do that. Since this is a Python library, this is meant to be used in CLI environments. The API is really really rough around the edges, though I have tried to handle failing conditions gracefully. You'll need an DoorDash account and DoorDash should be available at your location. On selecting a restaurant, a menu will be displayed. Select the items you'll like to add to your cart, quantity, special instructions etc and you're set.